For better fishing, get the sharpest, toughest, and most-durable Kitana Hooks available. Anglers tired of broken, rusty hooks will love Kitana Hooks. Forged from sturdy steel, Kitana Hooks are chemically sharpened and never get dull. Each of the six hook models are by people who know fishing. You’ll enjoy the same durability as the pros. Each hook is tempered to resist wear. You’ll spend more time casting and reeling in your next trophy fish. Available in six variations and in packs of six you’ll find a size and style for every tackle box. Use Extra Wide Gap hooks for extra strength potential and hooking power on wide targets. Aberdeen Light Wire Hooks are great for keeping baits in place when you drag them through cover. Round Bend Worm hooks also work great in heavy cover, slop, lily pads, reeds, and mud. All Kitana Hooks are designed with ultra-sharp ends. A secondary hook is ready to catch on to the slightest jerk of your prey. 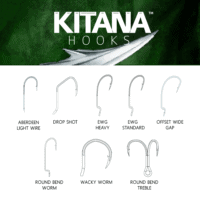 You’ll find Kitana Hooks will stick at almost every angle, depth, and speed. Kitana Hooks hail from Japanese design elements. They’re tournament-grade and feature either Knife Edge or Precision Point hooks. Precision Point hooks have tempered edges capable of any load. Knife Edge hooks have a sharp, piercing end designed for greatest penetration with the least amount of force. Sold with nearly every Trophy Technology product, these hooks are now available as standalone packs. For the first time you can buy replacement hooks as good as the ones your swimbait came with. Kitana Hooks work great with the Castaic Jerky J, the Monster Bass Patriots, and the BD Swimbait. If you’re serious about high-quality tackle, grab a pack of Kitana Hooks. 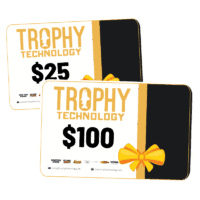 Works great with most Trophy Technology swimbaits, jerkbaits, crankbaits, and more.